An unforgettable occasion—not just for you, but for your guests, too! 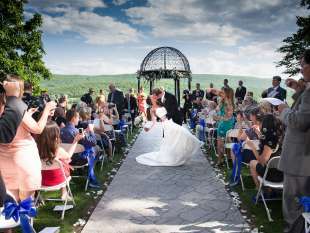 Planning a wedding in the Pocono Mountains reveals so much more than scenic views. Our vast four-county region is graced with breathtaking banquet facilities, service providers and attractions offering memorable experiences in every season. No matter the size or style of you event, you’ll find abundant amenities in the Pocono Mountains. Dreaming of a dazzling indoor reception? Receive the royal treatment at one of our award-winning resorts! Wishing for a Pinterest-perfect outdoor affair? Our farms and parks provide endless arenas for shabby-chic celebrations. Look to these wedding locations for a dose of destination inspiration, and check out our Pocono Mountains Weddings Pinterest Board for snapshots of mountain marriage trends. Contact each property directly for package details. For more assistance coordinating your details including accommodations for your guests, please contact our groups department.